As some of you may know, we are in the process of (hopefully) creating the New Zealand Colonial Marines. I have done a rushed and crude design for the Delta, based on the AUCM/ USCM Deltas. It has the Southern Cross off the NZ flag, one half blue and one half black. However, I'd like to make the Southern Cross a little bit bigger. Does anyone have any other design ideas? Last edited by prev on Wed Dec 24, 2014 3:44 am, edited 1 time in total. "12 Cheeseburgers and a Light Coke please!" I know that the New Zealand silver fern was considered as a 'new flag' awhile back, so how about this...? LOL! Now that made my day!!! Awesome to the max. I love the screaming Kiwi. As patriotic as I am / proud to be a Kiwi, kinda gotta say ... it's not gonna be easy to make a cool/fierce Screaming Kiwi (not to say, it's not worth trying, for sure). Not bad Yellowjacket. I did ponder the All Blacks Silver Fern, but decided against it to keep the simplistic design. 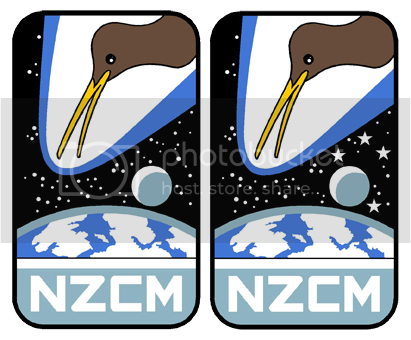 Also, I would prefer to use the red and white stars of the Southern Cross (look closely, the bottom star is slightly bigger), as they are the stars used on the NZ flag. @septic - old military emblems would be good for on armour, BDUs etc I feel. Was just thinking about it for examples of kiwis, but yeah, really liking the idea of using a derivative of the Whiskey 3 Company emblem on my armour somewhere - it's the Co I do for Nam re-enacting (crazy that it didn't occur to me - cheers for that ). I am looking at using the 2CNMWC (Canterbury, Nelson-Marlborough, West Coast. My old unit) 2 emblem on my armour, but I need to find the image to show you guys what it looks like. And also a red diamond (it is a symbol awarded to those who complete Infantry Corps training, I got mine way back in 2000) as well. Oh man, I want a sceaming kiwi patch! Btw, I just want to point out how much it pleases me to see new divisions popping up and the group growing. I want one too! because thats awesome! I wonder what the Master Sergeant thinks? 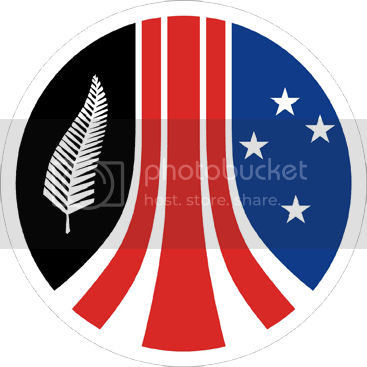 I like the Silver Fern, because it balances out the stars, but that's just my two cents. If you all do get a Screaming Kiwi together, I'm in for one. I'm trying to get everyone represented on my wall at work! Love the kiwi, not a fan of the fern at all. Here is the AUCM Delta that I put together years ago. Can you increase the size of your Southern Cross to match this one perhaps? My thoughts exactly, Master Sergeant. Maybe I could incorporate some maori designs in it? I am still hunting for something suitable, but again, I feel that a delta should be simplistic (like the original USCM delta) in its design. Love the screaming kiwi and the latest NZCM delta. Thank you for your input Master Sargeant. This is very cool, good job! I forget what the other patches are called. Does anyone have templates? So I'm guessing that the delta is good then?